BALTIMORE — When Baltimore's streets erupted in the worst rioting in 40 years, Republican Gov. Larry Hogan pledged to help heal the city. Instead, critics say, some of his administration's policy decisions over the last 16 months actually undercut local efforts to address the deep-seated poverty and violence that triggered the unrest in the first place. The conflict highlights the differences between Democratic lawmakers who want expanded services for their core supporters in Maryland's largest city and a GOP governor committed to more fiscal restraint. Baltimore's rioting was triggered by the April 2015 death of Freddie Gray, a black man who died of injuries in police custody. Hogan's response last year was swift: He called in the National Guard to help restore order and sent a strong message of support to local leaders. But this month Hogan refused to release an $80 million funding package authorized by state lawmakers, including $1 million for the Safe Streets program. The violence intervention initiative hires former felons and ex-gang members to mediate potentially violent conflicts. Without the $1 million, Safe Streets, which operates five sites in Baltimore's most dangerous and crime-ridden neighborhoods, could be forced to close. Lawmakers who supported the funding say Hogan's actions deviate sharply from his message. "The deeds have not backed up the words," said Sen. Bill Ferguson, a Democrat who represents Baltimore City. "When we talk about Baltimore's future, reducing crime is absolutely one of our most important priorities, and for an evidence-based program like Safe Streets to suffer the consequences of politics is devastating." The administration said lawmakers' all-or-nothing approach — which required the governor to approve or reject all the programs as a package — "trapped the funds in a budgetary political gimmick." "The Hogan administration has provided more than $20 million to Baltimore City to support violence prevention initiatives and remains committed to implementing programs and strategies that create real change in our communities," Hogan spokeswoman Shareese Churchill said in a statement. Hogan's response to the unrest included a plan to raze whole blocks of vacant houses in East and West Baltimore to revitalize the city's poorest neighborhoods. The legislature this year approved more than $92 million in new funds over five years to get the initiative going. Hogan's administration also notes that Baltimore gets more direct local aid than any other jurisdiction, as well as the highest K-12 funding per pupil. Baltimore is also slated to receive 69 percent of the state's transportation grants in 2017, the administration adds. 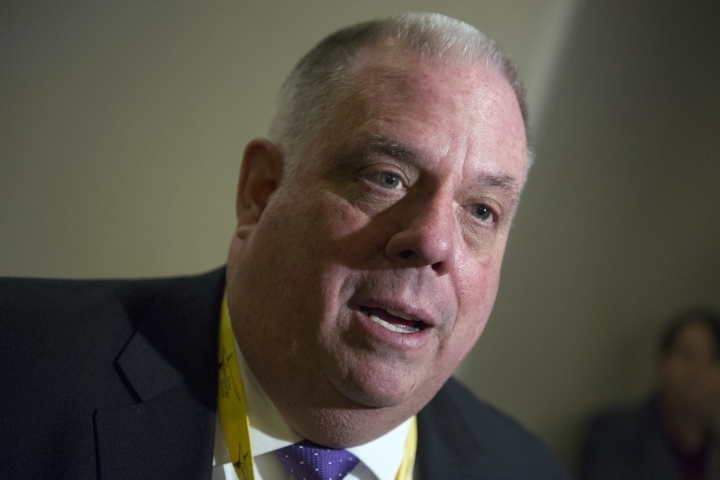 Hogan's 2014 election stunned the state, which had chosen just one other Republican governor in more than 40 years, and set the stage for a divided government. Critics say Hogan's policies favor his base in suburban and rural communities. After Hogan canceled a $2.9 billion light rail line project that would have connected largely African-American swaths of East and West Baltimore and instead funded highway projects in other areas, the ACLU and NAACP filed a federal complaint arguing it "fits a long pattern of discriminatory decisions impacting African-Americans in Baltimore." The Hogan administration said the Red Line rail plan was fatally flawed because a $1 billion tunnel would have been needed, and the governor has sought to deal with transit problems in other ways. On Friday he announced a $10 million federal grant to revamp the city's bus system. Baltimore City Council President Jack Young said he appreciates Hogan's efforts to help the city, but is "concerned when any funds are being withheld from Baltimore." "In the aftermath of Freddie Gray, the governor was great about putting money into our youth education programs. I think the governor is concerned about how we're spending money in Baltimore, but I'm encouraged that he's listening," Young said. Initially the administration said it didn't plan to find alternative funding for Safe Streets, as it has promised to do with about half of the programs in the $80 million package. On Tuesday, Doug Mayer, a Hogan spokesman, said the governor is "exploring different options," but didn't elaborate. Since the unrest last spring, Baltimore has seen a spike in homicides. In 2015 the city saw 344 killings, compared to 211 the previous year. So far this year the city has recorded 188 murders. Safe Streets workers mediated roughly 800 conflicts last year that likely would have turned violent or deadly, Baltimore Health Commissioner Leana Wen said. Shortly after the funding loss announcement, Wen gathered some Safe Streets employees in a park outside the program's newest site in West Baltimore, just blocks from where the worst of the rioting took place. "You prevented gun violence, shootings, people from dying." Wen said. "Families from being torn apart. You can't put a dollar amount on that, and you can't put a human value on that." Safe Streets has roughly 50 paid employees, Wen said, many of them former offenders trying to give back to their communities. The program also uses volunteers to connect with young people in high-risk neighborhoods. Tears streamed down Walter Outlaw's face. He works as a violence interrupter for Safe Streets, and told the group he wished a similar program had been in effect while he was growing up. "When I was a kid I was looking for an adult to take me to the store and buy me a frozen cup, and it never happened," he said. "Bullets are being dodged for real. Tomorrow I don't know if it's going to be my last day, and we're talking about whether or not we've got funding? Our lives are on the line, and we're worried about funding?" Associated Press writer Brian Witte contributed to this report in Annapolis, Maryland.